KINGMAX, has added to its product line an M.2 2280 PCIe NVMe solid-state drive, to provide users who want to improve their PC performance with another option in drives. While they already have their higher tier M.2 PCIe SSD PX-3480 (Gen3x4) and the PX-3280 (Gen3x2), the affordable/entry-level PJ-3280 (Gen3x2) has also been introduced, aimed squarely at budget users who are considering turning to SSDs to boost grab a boost in performance and a higher-speed and more economical option aside from 2.5-inch solid-state drives. With more and more systems supporting M.2 NVMe SSDs, including motherboards equipped with Intel Z270, X99 and the latest 2 Series/3 Series chipsets. As long as the M.2 slot is the M key version, a solid-state drive that comes with the M.2 PCIe interface can be employed to push the speed and performance of a computer to higher levels. 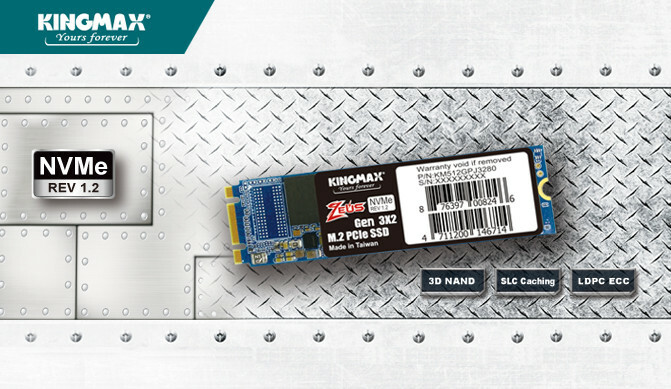 The KINGMAX M.2 2280 NVMe SSD PJ-3280 (Gen3x2) is manufactured using the standard 3D NAND Flash stacking technology, making it highly efficient, stable and durable. Meanwhile, the M.2 2280 is 22×80 mm in size and is available in capacities of 128GB, 256GB or 512GB, suitable for improving the performance of space-challenged notebooks and ultrabooks while expanding capacity. The PJ-3280 solid-state drive, which supports the NVMe high-speed transmission interface, features actual reading and writing speeds of 1,600 MB/s and 950 MB/s respectively in its maximum 512GB configuration, which are around twice to 3 times as fast as the reading and writing speeds of an average 2.5-inch SATA III SSD. So for those who are looking for a bit of higher speed than what SATA can provide, solid-state drives with M.2 PCIe interface will be their best solution in the pursuit of speed. The entry-level KINGMAX PJ-3280 will also be the best choice for users who are switching to M.2 PCIe SSDs for the first time. Unfortunately Kingmax has not announced Price of their new drives and google has not been too friendly with results. I have reached out for pricing and availability but have come up empty so far and will update when possible.